When it comes to kitchen countertops, there are several options available in the market. But choosing the right countertop for your kitchen can be tricky. It’s a big update for your kitchen and can be expensive depending on the material. To get the best value for your money, you should know the pros and cons of the popular choices to make an informed decision when you renovate your kitchen. In this blog post, we’ll discuss top four kitchen countertop materials to help you determine the right material for your kitchen. This material is made up of acrylic, polyester, or a blend of the two. They’re renewable, reparable, and highly resistant to stains and scratches. The popular brands that manufacture solid surfaces are Corian and Avonite. They come in hundreds of colours and patterns that resemble natural stone. As the name suggests, the material is homogenous as it’s same all the way through which means the surface that you see on top continues throughout the entire block of material. Solid surface materials are a middle range choice in terms of aesthetics and price. One of the major drawbacks of solid surfaces is that they’re vulnerable to high heat which can cause the material to scorch and crack. Laminate countertops are one of the most budget-friendly choices. They’re composed in the same way as laminate flooring by treating and pressing layers of paper together with resin under high heat and pressure over a thick base of composite chip wood. Laminates are available in different colours and patterns that resemble wood, natural stone, quartz, etc. But if you’re looking for a sturdy countertop, laminate doesn’t make a great choice. It can easily scratch and is susceptible to water damage. Most homeowners consider granite as the top choice when it comes to countertops. It has a great visual appeal that contributes to the overall appearance of your kitchen. But as granite is a natural material, the patterns vary which can make matching slabs challenging. To keep natural granite in good shape, you need to wipe off oils, soda, acid, wine, and other stains quickly. You’ll also need a sealing done every year. Also known as engineered stone, quartz was invented about 50 years ago and became one of the top countertop materials in millions of kitchens across the globe. The material is composed of 90% stone-like materials such as silica, mirrors, natural stone waste, glass and 10% binding resins. It’s a green product that comes with fantastic looks and styles. It has a non-porous surface which makes it resistant to stains, scratches, heat, impact, and acid making it an almost maintenance free countertop material. However, it’s an expensive choice. Now that you know the pros and cons of these materials, take your pick as to which best suits your kitchen needs and budget. Note that you should make your decision based on certain parameters such as durability, maintenance and appearance before investing. 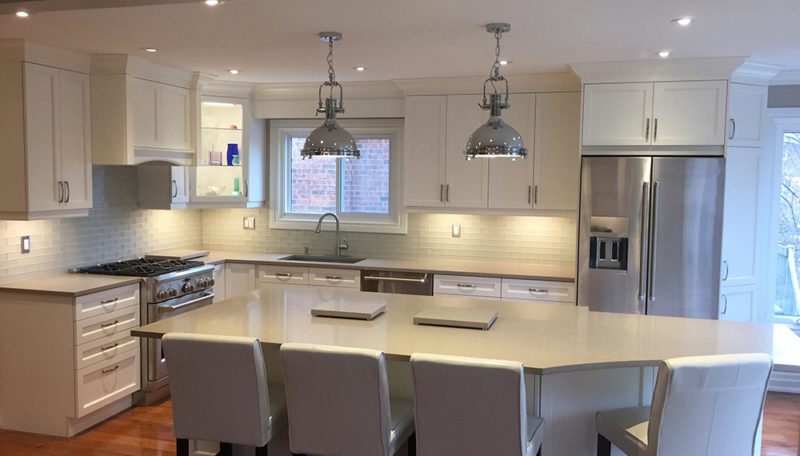 At Euroline Kitchens, we have been serving Mississauga and the GTA as an industry expert in custom kitchen renovation services for over a decade. Contact us for all your kitchen countertops, cabinetry, remodelling and renovation needs.